The European company Bitwala that provides services for paying bills by transferring Bitcoin to fiat and more recently started offering BTC to PayPal transfers has added a new service – Bitcoin-powered Debit Cards. According to the service the cards should be already available for “Tier 2 verified” customers in the form of a physical or a virtual debit card nominated in Euro. You can order a virtual Bitcoin debit card for 5 EURO or a physical card for 10 Euro with the regular 0.5% percent fee of the service and funds should be credited on the card up 3 business days and often a lot faster according to the information available (during work days it should not take more than a few hours). This means that similar to their BTC to PayPal service the transfer of Bitcoins to your BTC powered debit card will not be immediate and this in the world of crypto currencies is a serious issue. When you want to spend Bitcoins through a debit card that is powered by BTC you will normally want to be able to immediately spend the coins as fiat and not having to wait for up to a few days. Thee are already alternatives for Bitcoin debit cards that we have tried and that offer users to immediately spend their available coins in a wallet or loaded to the card as fiat such as Xapo Bitcoin Debit Card or E-coin Bitcoin Debit Card. Though having more alternatives and different options can be helpful at times, especially in the world of crypto currencies, so this is one more option for a Bitcoin debit card that you can have. We have recently tested the service Bitwala for sending BTC to PayPal, but the use of eChecks makes the transfer of the coins to money in PayPal very slow, so we started looking for alternative. One such alternative that we found, also operated by an European company that apparently is targeting only European users (supports only EUR as a fiat currency), is called Coinimal and we have decided to give it a go as well. This service supports not only Bitcoin to PayPal, but sending Bitcoin to bank accounts via SEPA as well as multiple other payment systems, though our focus was on the PayPal support. 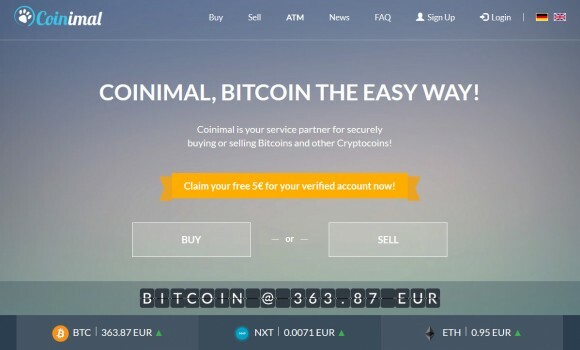 Another interesting thing about Coinimal is that it is not only for selling your Bitcoins or NXTcoin and having the respective Euro amount sent to PayPal, bank account or other payment processor, but you can actually also buy BTC as well as NXT and even Ethereum’s Ether coins with it. Once you register and verify your email address you will be able to start using the service for selling crypto coins for Euro with a daily limit of 1000 Euro, 7500 Euro monthly limit and 30000 EUR total limit, but you will not be able to buy crypto coins. You would need to go through an additional verification process to increase your limits and get the ability to also buy crypto coins, but the good thing is that right after registration you can immediately test the Bitcoin to PayPal functionality or Bitcoin to SEPA wire transfer. Do note that since the service is targeted at European users if you are from another country you might not be able to go through all levels of verification, but you should still not have trouble using the lower limit levels. Here are how the different verification levels go and what are the requirements and the limits you get with each of them. 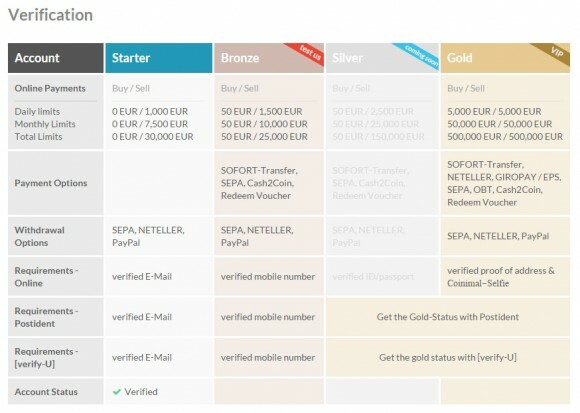 Going for the maximum Gold level would give you access to the full functionality offered by the service as well as very high limits for both buying and selling the supported crypto currencies, but in order to pass it you need to verify your identity and provide the respective documents to do that. If you do not require to have high limits and don’t need the functionality for buying crypto coins using the service you can be just fine even with the Starter or Bronze plans. For the Bitcoin to PayPal transfer functionality this should be enough with the standard limits you get, at least for checking the service out to see if it will provide you with what you need in terms of functionality. When you go to the page to sell Bitcoin (or NXTcoin) for Euro and have the money sent to your bank account or to PayPal you have to set an amount of coins you want to sell. There is a limit of minimum 50 Euro equivalent in coins to initiate a transaction and that goes for both BTC and NXT coins, regardless of where you want to transfer them. After you enter the amount in coins you want to sell you will see the base price per Bitcoin and how much you will receive depending on the payout provider you have chosen (minus the service fee). 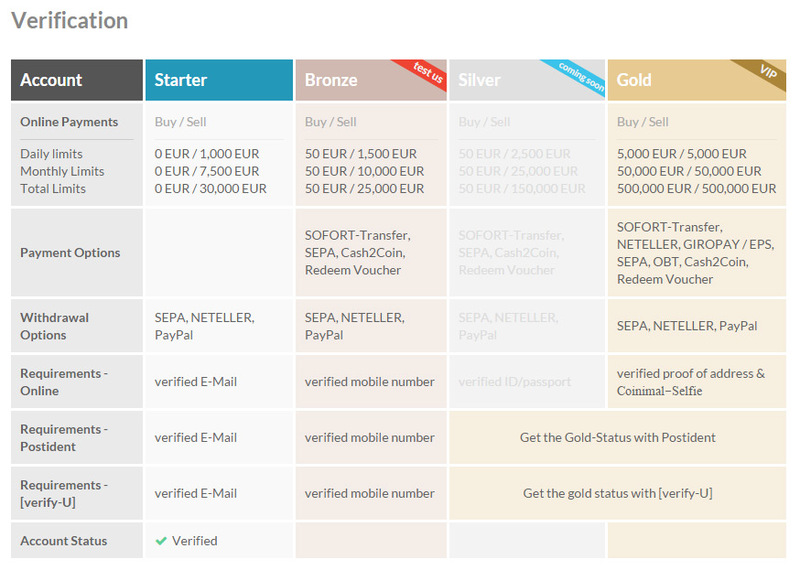 The SEPA wire transfer comes with the lowest fee and the fee for PayPal transfers is apparently higher as it also takes into account the PayPal fees, do note however that the estimate you get in EUR might be a bit less when you go to the final confirmation page for initiating the Bitcoin to PayPal transaction. After you send the BTC to the wallet address you are given you will have to wait for the network confirmation that can normally take up to about 1-2 hours and then you can expect to see a money transaction to PayPal to be initiated. Since the process can take multiple hours to be completed you will also receive an email when the money have been sent to your PayPal account. In our test for sending about 50 EUR (the minimum) converted from Bitcoin to PayPal the total time needed was about three and a half hours from the moment we have initiated the process until we have got the money in our PayPal account. The good thing here is that unlike Bitwala that use PayPal eCheck for the transfers this service does a normal regular transfer and you have the money available immediately in your PayPal account without having to wait for their confirmation. So if you want to be able to quickly and easily transfer Bitcoins to Euro in your PayPal account, then Coinimal is the better solution available from the two services that we have recently tested, though both of them do work pretty much equally well for BTC to SEPA bank transfers. Bitwala is an interesting service that makes bank wire transfers on your behalf in exchange for Bitcoins, so that you can pay your bills with BTC for example. It is an European company that currently supports only SEPA bank transfers, so it is usable to send BTC to an European bank account only, though you can send Bitcoins from anywhere in the world. The primary operating currency is Euro (EUR) with only 0.5% fee on the BTC to Euro bank payments, but multiple other currencies are also supported with a higher fee. This makes the service an interesting and fast way to transfer Bitcoin to bank accounts in Europe and that goes not only to convert BTC to Euro in your bank, but also send payments. Things just got even more interesting with the service just announcing the addition of support for sending Bitcoins to PayPal accounts as well with the same low 0.5% fee for Euro conversion. This makes it even more interesting for worldwide use and not only for European Bitcoin users like it was before thanks to the BTC to SEPA wire transfers. Since PayPal is the preferred method for payment when using eBay and making other online purchases thanks to the layer of protection that it adds over the use of a credit card directly the ability to quickly and easily convert Bitcoins to Euro and have them in your PayPal account seems like quite a useful feature. 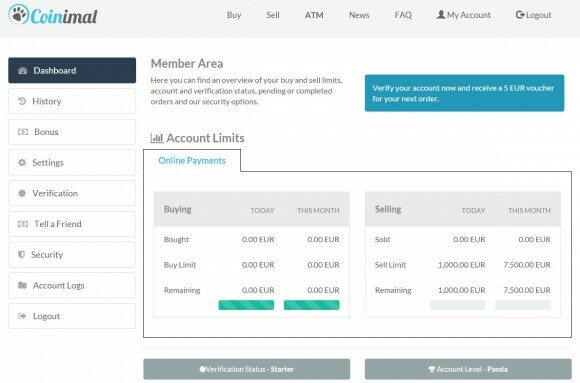 As soon as you register you will have a monthly limit of 200 Euro, but as soon as you confirm your email address and enter your basic details such as name and address the limit will be increased to 500 Euro. For the next level of 2000 Euro limit you need to provide identity verification documents that are required in order to comply with EU law. For the third level with a monthly limit of 50000 Euro you would need to go through a quick Skype call with a representative from the service. For most people even the first level of verification will be enough to try out the service and see if it will work as well as you would expect it to and if it is something that you might find useful either for paying bills with Bitcoins or for sending BTC to your PayPal account. The first test transaction to send Bitcoins using the service to PayPal that we did took us a little over 5 hours from the moment we have initiated the procedure and sent the BTC to the moment we’ve received confirmation that the money have been sent to our PayPal account. Out of those a bit over 5 hours roughly two were needed for the Bitcoin transaction to be confirmed on the network and another three for the PayPal transfer to be initiated. There is a bit of a problem here that we did not see clearly explained with the BTC to PayPal support that the service has introduced and that is the fact that eChecks are being used to fund your PayPal account and while we got a confirmation on the transfer received, the money sent are not immediately available for use like you would probably want them to be. According to PayPal: “This eCheck payment will post to your PayPal balance once the funds have cleared from the sender’s account, which usually takes 3-5 business days” and we have to wait for November 12th for the eCheck payment to be cleared and for us to actually be able to use the funds from within PayPal. Unfortunately this pretty much kills the usability of the service if you have to wait up to a week after you initiate the BTC to PayPal transfer as you probably would want to be able to use the funds withing a few hours, not within days. It will still be faster and more convenient to do a BTC to SEPA wire transfer to the bank account of a card linked to your PayPal account than to take advantage of the Bitcoin to PayPal service!